The Smarter Toys IQ Treat Ball Dog Toy is a toy which can be filled with dog treats or kibble which your dog can retrieve from the ball by rolling the ball around on the floor. The opening which dispenses the food inside the ball is adjustable to make it easier or harder for your dog to retrieve the treats inside. What is the benefit of using a Smarter Toys IQ Treat Ball Dog Toy for your dog? The Smarter Toys IQ Treat Ball provides both exercise and mental stimulation for your dog. With over 50% of pet dogs estimated to be either overweight or obese, exercise is an important consideration. An adequate amount of exercise can not only help your dog burn calories in order to stay fit and healthy but it also helps reduce stress and pent-up energy for your dog. Dogs that are properly exercised are generally better behaved with fewer undesirable habits. Boredom is another common problem for pet dogs, especially for those dogs that are left alone for long periods of time while their owners are at work or pursuing their daily routines outside of the home. The Smarter Toys IQ Treat Ball provides mental stimulation for your dog as he works to retrieve his treats or kibble from inside the ball, keeping him from becoming bored. Preventing boredom can help avoid many behavioral and health issues. Boredom and the associated stress are a common cause of bad behavior and even medical issues in dogs. The Smarter Toys IQ Treat Ball Dog Toy is well-built and sturdy. It is available in two-sizes: 3 inches in circumference and 5 inches in circumference. As your dog rolls the ball across the floor, the treats inside of the ball fall out and become available for your dog to eat. The level of difficulty can be changed by adjusting the size of the opening through which the treats spill out. As your dog learns to use the ball, you can increase the level of difficulty to increase your dog’s level of engagement with the toy. I helped one of my friends choose this toy for her dog, a 4 year old Doberman mix. She has used it now for about 4 months and she and her dog both love it. She started out with the easiest setting, the opening wide open but quickly had to close it a bit to make it more challenging. She is using the 5 inch ball and so far the ball is still functioning well and has stood up to constant use with no problem. Who can benefit from the Smarter Toys IQ Treat Ball Dog Toy? Many veterinarians and other pet care professionals are now recommending using food puzzles rather than food dishes to provide food for your dog, particularly if you are giving your dog a diet of dry food. The Smarter Toys IQ Treat Ball Dog Toy is a good candidate and works quite well as a food puzzle. It has many benefits for your dog. Part toy, part treat dispenser, the Smarter Toys IQ Ball Treat Dispensing Dog Toy is a barker favorite. The Smarter Toys IQ Ball Treat Dispensing Dog Toy uses your dog’s favorite food or treat to keep him mentally stimulated, physically active, happy and healthy! The Smarter Toys IQ Ball Treat Dispensing Dog Toy is made from durable, non-toxic thermoplastic that holds up to the toughest dogs. Portion controlled meals or treats can be loaded into the opening and is easy to clean and refill. 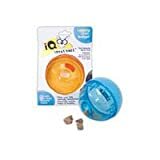 Find more Smarter Toys IQ Ball Treat Dispensing Dog Toy products on Amazon!